The Weser RWG identified the provision of Flood Protection & Assimilation as the most important high level function within the estuary, but with Transport & Accessibility and Ecological Function & Diversity also ranked as being of high importance (Figure 16). Figure 16: Weser uses/issues importance weighting. Recreation & Social use was scored as being a function of moderate importance. For the purposes of the TIDE project the Weser has been divided into 6 zones including one relating to the anabranches, these zones covering the reaches stretching from the mouth of the estuary to the centre of the City of Bremen. The majority of the intertidal and subtidal area within the estuary is included within the Natura 2000 designation, with only the upstream area of Zone 1 within the main urban and port area of Bremen excluded from this. Apart from the main urban and port area of Bremen located within Zone 1, other main urban and port centre is located in Zone 5 (Bremerhaven). The majority of the remaining reach features agricultural usage with smaller urban centres, and with the main channel both constrained by flood protection structures and dredged in order to maintain navigation. Several large islands are present in the middle estuary (Zones 2 and 3), e.g. Harriersand and Strohauser Plate. 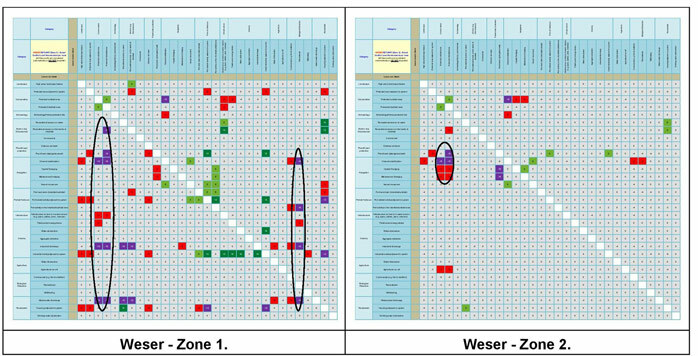 The conflict matrix process for the Weser (Figure 17) identified 29 high level conflicts with 4 of these scored at -10 or below), together with 19 strong synergisms, 2 of which were scored as very strong (e.g. 10 or above). However, whilst this means that the Weser was identified as having a considerably greater number of high level conflicts than the Elbe (29 interactions scoring -7 or below for the Weser compared to 12 high scoring interactions for the Elbe), this may to some extent be a result of the RWG weighting of topic area importance, which rated the four main topic areas of greater overall importance than the Elbe RWG (a score of 6.7 compared to 5.8 and a mean across the TIDE estuaries of 6.0). This potential skew is further borne out by a much greater number of strong synergisms than for the Elbe. However, whilst this topic importance skew might be considered likely to have influenced the number of high level scoring interactions, it is of note that only 4 of the 29 were rated as severe (e.g. -10 or above) suggesting that there may be additional ameliorating factors influencing conflict severity. The main interaction areas of user conflict were between conservation requirements and navigation needs, as well as between conservation requirements and infrastructure and commercial access, with archaeology also observed as impacting on navigation. Access onto the system, as well as flood protection needs and a range of activities associated with navigation requirements were recorded as having impacts with conservation needs, with infrastructure, agricultural run-off and residential development also impacting on conservation protection requirements. Navigation requirements also impacted on recreational activity, landscape and flood protection needs. Despite this, a range of strong synergistic interactions were also produced by the analysis, including linkages between conservation requirements and landscape value and archaeology, as well as between landscape and recreation and within various navigation requirements. The provision of flood protection was also identified as being a benefit for ports related activity adjacent to the estuary. Strong negative and positive associations for the Weser are provided in Tables 3 and 4. Figure 17: Weser - high scoring user interactions per zone. Table 3: Strong negative associations between uses/users for the Weser Estuary. Table 4: Strong positive associations between uses/users for the Weser Estuary. Zone 1 (Figure 18a) of the Weser covers the reach within much of the City of Bremen and with associated port activity, with parts of the reach also included in the Natura 2000 designation for the estuary. A series of high scoring interactions were observed across a range of uses in this zone identified as impacting on the nature conservation requirements, as well as recreational fishing. Downstream from the City of Bremen (Zone 2) (Figure 18a), a considerable reduction in the number and severity of interactions was observed, this area featuring primarily agricultural land use along the banks, although being included in the Natura 2000 designation. A cluster of issues associated with navigation requirements impacts on nature conservation protection are noted. Figure 18a: Main conflict scores for the Weser Estuary. Zone 3 (Figure 18b) which lies primarily within an area of agricultural land with marsh areas and inclusion in the Natura 2000 designation features an increased impact severity of uses on the conservation interests, with high scores arising from not just navigational requirements but also flood protection, port land claim industrial and residential discharges and agricultural run-off. Further conflict interactions arise from nature conservation needs on navigation and port expansion (land claim), with navigation needs (dredging) also affecting flood protection. Zone 4 (Figure 18b) on the Weser relates to the anabranches and in general features a low level of impact interactions, but with a number of high scoring conflicts from uses acting on the conservation protection needs of the area. Zone 5 (Figure 18c) towards the mouth of the estuary also exhibits a range of high scoring user interactions broadly comparable to those of Zone 3. The reach whilst running through areas of extensive marsh and mudflat included within the Natura 2000 designation also includes the port of Bremerhaven and associated urban usage. These interactions again centre around multiple user impacts on the conservation protection requirements of the reach, but with a similar, albeit more restricted corollary impact as well. Notably, requirements for maintaining navigation and flood protection, as well as ports related activity have a high scoring impact on landscape value in this area of the estuary. Flood protection and dredging activity is also scored as impacting on residential housing adjacent to the estuary. Zone 6 (Figure 18c) at the mouth of the estuary includes Natura 2000 habitats of extensive intertidal mudflats as well as some fringing marsh. The area is semi open coast but with management of the channel for navigation maintenance. Navigation requirements are identified as having a considerable impact on both landscape and conservation protection functions, with infrastructure needs having a similar impact severity on these uses. Agricultural water abstraction and run-off also severely conflict with the nature conservation protection needs, whilst the requirements of nature conservation are noted to have a high conflict level on both the navigation needs (including dredging) and port related land claim. The conflict matrix analysis for the Weser indicates a considerably greater number of high scoring conflict interactions for most zones than for the Elbe. However similarly, a greater number of high scoring synergistic interactions are also recorded, which suggests that RWG scoring of conflict levels was perhaps higher than for the Elbe. This conclusion is somewhat borne out by the greater score attached to the high level main topic assessment undertaken by the RWG (scoring this at 6.7 compared to 5.8 for the Elbe and with a TIDE estuaries mean of 6.0). However, it is also noted that usage scores for the Weser as a whole, were considerably greater than for the Elbe (but below those for the Scheldt), and it therefore may the case that the elevated conflict and synergisms scores between uses are to some extent a reflection of a greater level of use in the estuary compared to the Elbe. 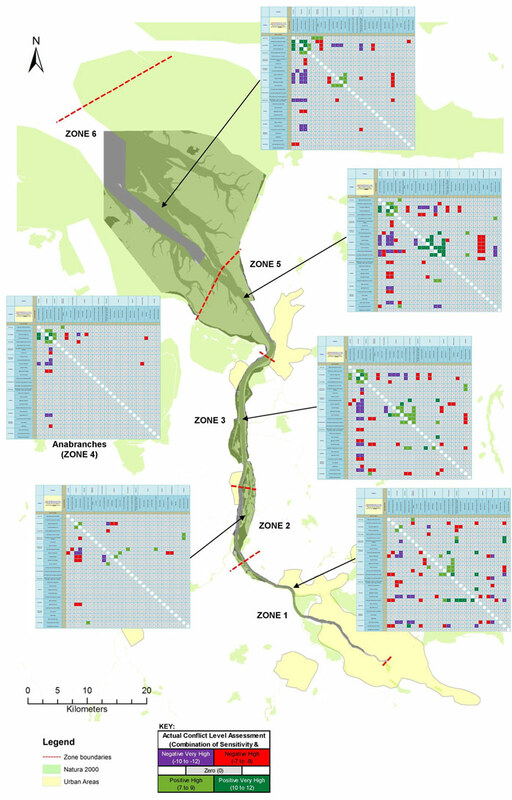 The outcomes from the matrix analysis process are interesting in that they indicate that the greatest severity of conflict interactions arise towards the outer estuary zones (zones 3, 5 and 6), primarily, but not exclusively relating to navigation related activity on the nature conservation aspects of the estuary. These issues largely arise from the need for management actions along the outer estuary to maintain the navigable fairway for traffic to and from the port of Bremen. It is also apparent that the corresponding requirements for conservation protection (the Natura 2000 site) produce conflicts with the need for the maintenance of navigational access. Zone 1, which covers much of the urban area of the City of Bremen, features a reduction in the impact levels relating to navigation:conservation interactions, this not unexpected given that around half of the zone is outwith the Natura 20000 site boundary. However, there are high scoring impacts observed on recreational activity such as fishing and residential housing provision arising from port and port-related activity as well as industrial uses and the discharge of residential effluent. 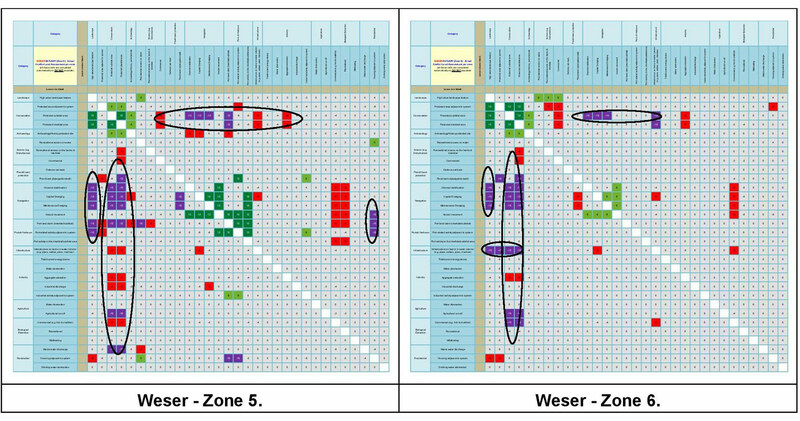 Section 8 (Appendices) provides the Conflict Level Assessment spreadsheets for Zones 1 to 6 of the Weser in greater detail (larger scale).